← Coat Closet Rod…or Industrial Curtain Hardware? Son, being popular is the most important thing in the whole world. 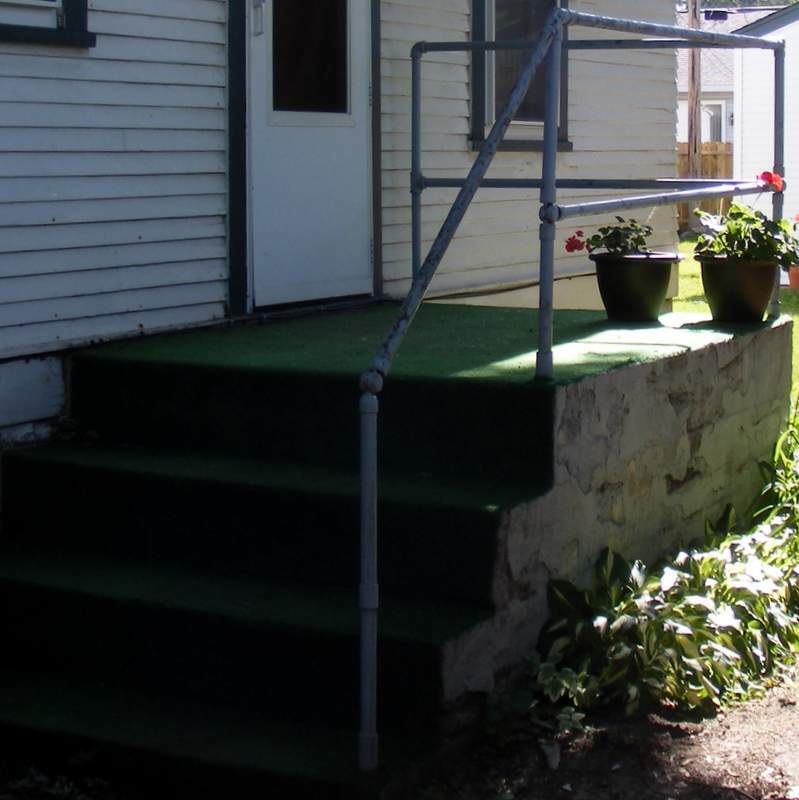 The steps to our side door were ugly, solid, concrete steps with worn out plastic grass on the the top. They weren’t very pretty, but they were solid enough, and we had no immediate plans to replace them. That changed when we built a fence. The old steps were not very pretty. When we built the fence, it blocked the path from the steps to the driveway. To get to the garage, you had to perform a ‘U’ turn at the bottom of the steps, and then walk back between the steps and the fence to the gate. A small inconvenience. But then we had a storm, which made the ground very muddy and very inconvenient. I made a makeshift boardwalk from pieces of our old garage door (one day I’ll have to tell you the story about taking out that garage door). It turns out that smooth, wide pieces of garage door are not the best path-making material ever. It soon became quite slippery, especially for friends with inappropriate shoes. So, we needed a better solution. We decided to remove the concrete steps and replace them with wooden ones pointed in a more useful direction. Eventually I replaced the boardwalk with pavers. That sounds so easy, it makes me smile. 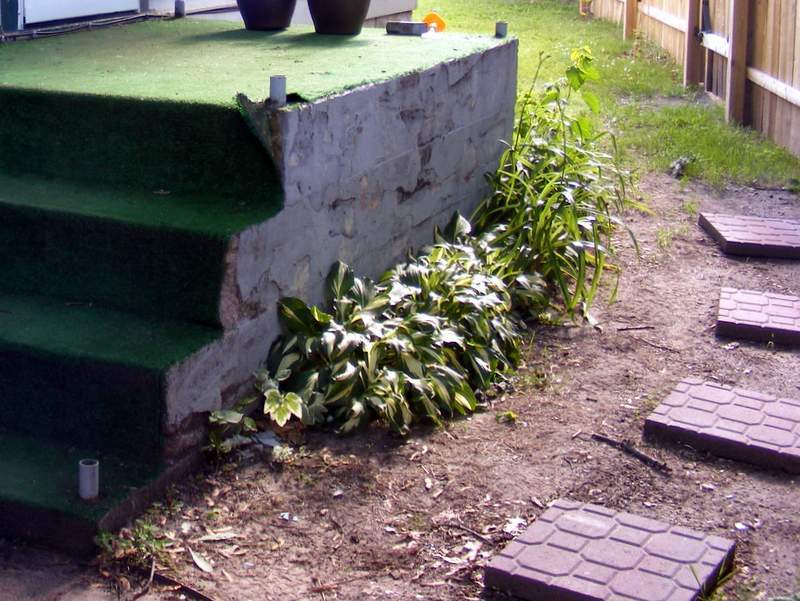 The part that I find most amusing is “…remove the concrete steps…”. It’s such an obvious step, almost not even worth mentioning. All it will take, I thought, is me, a sledge hammer and a spare Saturday afternoon. What it actually took was me, Stacey, wire cutters, chisels, crowbars, two whole weekends, and a JACK HAMMER! I found out that the price to rent the jack hammer over a weekend is the same as for one normal day. This even applies to long weekends. The first weekend I wanted to rent the jack hammer was a long weekend, because the Friday was the Fourth of July. Brilliant! I thought. Three days for the price of one! But I hadn’t really thought it through. I hadn’t thought about the neighbors. Imagine how that must have been. They were probably relaxing on the Friday morning of a long weekend, enjoying the prospect of a well-deserved break from work. Perhaps they were planning to celebrate the independence of the nation by hosting small, quiet, informal gatherings of family and friends. Then, at about ten o’clock that Friday morning, the explosive staccato sound of a jack hammer viciously assaulted their ears. Imagine how popular we became. As welcome as an outhouse breeze. Since we really had no wish to ruin anyone’s weekend, we tried to only used the infernal machine for a short period in the middle of each day. And, even then, it wasn’t a continuous noise, mainly because of the fiendish construction methods that the step builders had used. But it was a pretty bad noise, and I’d have found it quite annoying, to say the least. If it’s any consolation to my neighbors, it does go down as the worst, most difficult, and horribly frustrating project I’ve done on this house. My next post will be about demolishing those steps and why it was the worst project ever. This entry was posted in Before & After, Construction, Outdoor Building Projects, Yard & Garden and tagged D'oh!, demolition, fence, Garage Door, yard. Bookmark the permalink.